My apologies for the later post today! I've been feeling under the weather since Christmas, and just can't seem to shake this cough. I don't know about you, but when I'm not feeling 100%, sometimes just a little something sweet can cheer me up. Cupcakes usually do the trick, but I rarely bake them anymore because I don't want to end up with a dozen tempting treats in the kitchen to split between my husband and I. The solution? Cupcakes for two. 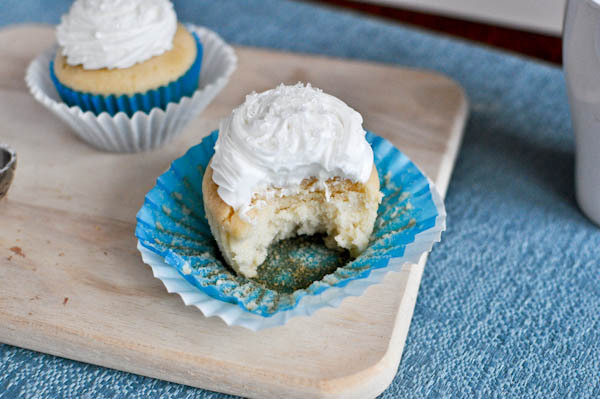 How Sweet It Is blog has a wonderful recipe that yields two delicious vanilla cupcakes -- one for you and one to share, or one for you now and one for you later! Enjoy!